On Thursday’s game, Maggie Schreiter and Todd Coleman were tied for the lead heading into Final. Both wagered everything, and both missed, giving the game to Will Anderson, who entered in a distant third. I applauded the wagers, but others were not so kind. Even in the comments here, there was disagreement on how the new tiebreaker rules would affect the optimal move. After analyzing the math, I’ve concluded that the optimal play all boils down to one thing: each player’s perceived confidence in the Final Jeopardy! category. These are the only two options because your goal here is maximizing expected value. Your estimate is going to be rough, at best. Some clues on opera are slam dunks, and some on current events are nigh impossible. Even Ken Jennings missed a clue about comic books; his wager should tell you how excited he was to see that category. You and an opponent each have a $100 bill. You each have the option to take a double-or-nothing gamble, with a certain probability of success. You make your decisions whether to gamble simultaneously. Whoever has more money after this round keeps it and returns to play another game; if there is a tie, only the winner of a coin-flip will keep his money. If both of you take the gamble and are unsuccessful, you both lose. We’ll assume the only goal is to return the next day. We won’t take winnings into account. This problem is solved quite nicely using game theory, particularly the concept of dominance, which I’ve covered in depth in the past. Let’s set up a matrix with all of the possible outcomes. Each player can choose between wagering everything and nothing, and each player can be right or wrong, yielding a total of 16 possible outcomes. Player A, in red, is represented in the rows; Player B, in green, in the columns. Let’s break down all of the possibilities. For the sake of simplicity, I’ll say each player has an even chance of winning a tiebreaker. If both players wager nothing, they’re guaranteed to go to a tiebreaker (yellow cells), so each player has a 50% chance of winning the game. 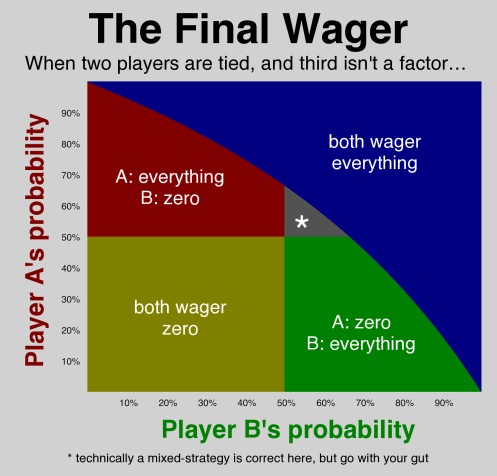 If Player A wagers everything and Player B wagers nothing, Player A will win if he responds correctly (probability A), and Player B will win if he responds incorrectly (probability a). Player B’s response is irrelevant. The reverse is true if Player B wagers everything and Player A wagers nothing. Those are easy. More complicated is when both players wager everything. If one player is right and his opponent is wrong, that player will win. If both players respond correctly, they’ll go to a tiebreaker, which each wins half of the time. Using that knowledge, we can model the probabilities in a simpler matrix. Player A’s outcome is listed first in each cell. You’ll see that each player can guarantee a 50% chance of winning by wagering nothing, no matter what the other player does. We say that wagering nothing is weakly dominant. Even if we kick that down by just 1%, so that both players have a 49% chance of responding correctly, we’ll see a pattern emerge. Let’s look only at Player A, in red, whose choices are represented in the rows, and whose probabilities of winning are listed first. If Player B wagers everything, Player A will have a better chance of winning if he wagers nothing. If Player B wagers nothing, then Player A will again be better off by wagering nothing. Therefore, if both players have a worse-than-average probability of responding correctly, they should both wager zero and play for the tiebreaker. In this case, we say that wagering nothing is strictly dominant. Note that this has nothing to do with a third player, if one is still around. Both of our co-leaders are trying to maximize their own chances of winning. What happens if both players have a better-than-average shot at Final? Let’s try 51% to begin. Here’s where the game theory kicks in. If you’re playing rock-paper-scissors, and you know your opponent is going to throw a rock, what do you do? Of course you’re going to throw paper! So let’s assume, for starters, that Player A somehow knows her opponent is going to wager nothing. What should she do? That’s right: she should wager everything and take advantage of the slightly increased probability that she’ll win. The problem, now, is that if Player B does the same thing, they’ll both see their probabilities of winning vastly reduced. Now let’s assume each player has a 70% chance of a correct response. Hmm. Now each player does better by wagering everything. For such a high probability, wagering everything is the dominant strategy for both players. Those of you who are familiar with game theory will recognize this as the prisoner’s dilemma: each player is compelled to wager everything, but both would have better odds of winning if they both wagered nothing. That means there must be a “sweet spot” between 51% and 70% where wagering everything every time becomes the right play. In case you want to try to solve this for yourself, I’ve put the calculations in the spoiler box below. For wagering everything to be the dominant strategy, we’ll also have to prefer it if we know the other player will go all in. If we’re Player A, that means the probability we’ll win by wagering everything must be greater than the probability we’ll win by wagering nothing. We also assume A and B are equal to each other. Let’s say you’re a literature professor playing against a rocket scientist, and PHYSICS pops up as the Final category. Ruh roh. What now? Clearly, it’s unlikely you have the same chances of nailing this clue. But what you should do? Let’s assume you, as Player A (rows), have a 40% chance of getting it correct, while your opponent is at 60%. For you, wagering nothing is strictly dominant over wagering everything. Your opponent, therefore, should figure out which of his options is better given your likely passive play. Wagering everything is the better play for your opponent. This holds true whenever your opponent’s probability is greater than 50%, and yours is less than 50%. Of course, you might go all-in regardless, which would result in a worse chance for both of you. No one said this was easy. What if your opponent has a high probability of converting? Even if you have a very low chance of getting the clue right, you’ll want to consider wagering everything, as well. Put everything together and we get a nice little graph. Phew. Anyone else need a break from math for a while? And this is only math – recall that only 3 tied players have ever wagered zero. Not to mention that the two players could have wildly different assessments of the situation – or ignore the game theory altogether, and go with their gut! Given the rule change in tournaments after the triple-zero 2013 Teen Tournament semifinal (a tie for first at zero being treated like a tie at any other amount with a tiebreaker given to see who advances), if third isn’t present would that have any affect on whether zero or everything is better in a tournament setting? Thanks, Kelly! Yes, there would be a big effect in a 2-player tournament situation. As for a wager somewhere in the middle, the presence of a third player shouldn’t alter your need to maximize expected value. We’ll see if the numbers bear this out. The most minor of minor nits, but from an expected value approach, in the red and green zones the highest expected value move would be to wager your score – 2*third’s score – 1, since you’re getting even money on a greater than 50% question. Overall though, this is an impressive amount of detail for something that might happen once or twice per season. Interesting point, Devin. I expanded my matrix to include an in-between wager, and it resulted in multiple Nash equilibria. IIRC, for A = 60% and B = 35%, the NEs were at (all, zero) and (mid, all). Here’s the matrix when A = 60%, B = 45%. For Player A, the mid-range bet will dominate the zero bet iff A > .50 and A+B > 1. The mid-range bet will dominate the everything bet iff A+B < 1 and A < (2-2B)/(2-B). Note that the mid-range bet can never dominate both because of the mutually exclusive A+B ? 1 restrictions. Tonight’s Jeopardy showed that getting greedy can cost you. One player had $14,000 and the other had $21,000. They both got the question wrong. The returning champion with $14,000 but bet zero’s dollars. The challenger with $21,000.bet $7,001. If he would have bet $7,000 he would have had a 2 out of 3 chance of have a tie or better. Instead he lost by 1 dollar.